Welcome to the April 2012 Edition of the HamSphere Newsletter. It has been exciting times at HamSphere over the past months with many new additions. We have received a fantastic response from our operators regarding the new QSL-card management system. Some 34000 QSL-cards have been sent. Thank you for using the QSL-card system. But do remember that a QSL-card is a confirmation of an established contact, called QSO, and should only be used as such. Latest news! You are now able to get an overview of your logged contacts with our new statistics module. You can easily get an idea of the number of worked countries as well as contacts. 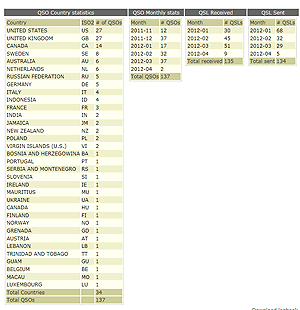 The number of received QSL cards and worked QSOs are also listed on a monthly basis showing your activity. Finally you will be able to extract your logbook with a download link. The log book is in tabulated text form. Before you can use the statistics you will need to get familiarized with the built in Log Book and QSL-Management. So just start your HamSphere transceiver now and click CLUSTER/LOG. We have added two new servers to the network. Sydney, Australia and Reykjavik, Iceland. The purpose of the Australian server is to serve Australia, New Zealand and The Pacific Ocean as well as South East Asia. If you are operating from the area we would like to have a report about its performance. The Iceland server is hosted by a very interesting company called GreenQloud based in Hafnarfjordur just west of Reykjavik. This new North Atlantic addition to the network will serve Northern Europe as well as the North Atlantic region. Read more about the Green Energy server below. 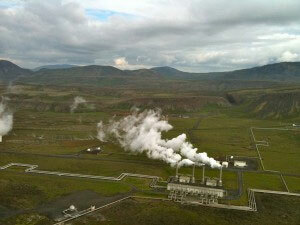 We are currently testing the GreenQloud servers on Iceland with very good results. Our users have experienced exceptionally good response times and server stability over the past weeks. Their Cloud servers can be used for inexpensive low end simple web server solutions as well as high end database driven server platforms. GreenQloud also offer their customers to see their live energy metrics and carbon savings in the control panel. Since HamSphere is using a lot of storage space for online QSL-cards we may later use their Truly Green™ cloud storage which is a scalable file and object storage that automatically grows. Please visit www.greenqloud.com for more info. Lately the problem of “Doubling” has increased on HamSphere. It can be annoying but there is a remedy. Doubling occurs when two stations using a two-way radio start talking at the same time and on the same frequency. This usually happens due to the confusion on how to use the Amateur Radio protocol. A licensed Amateur Radio operator is taught the protocol prior to getting licensed, but as we also allow non licensed users, so called “Radio Enthusiast”, who may have less experience in two-way communications, the “doubling” has increased. At the end of each over (transmission) you say: “the call sign of the user who will speak next“ followed by “this is” and “your callsign” and “over”. That’s it! Of course, if you make just quick transmissions, you can just end the transmission with “over”, but it is then extremely important that you use just that phrase. I also sometimes use the phrase “go ahead” to end my transmissions. The important thing is that there is no doubt of when your transmission is over and no doubt of whom you leaving the microphone to. HamSphere is a realistic simulation of a real Shortwave band covering all QSO types that Amateur Radio consists of. These are; Simple QSO, Group QSO, Network QSO and Pile Up QSO. It is important that you are comfortable with these types and we have compiled a QSO Type guide for the purpose here. If you feel uncertain about this, please study the guide and learn how to identify the different QSO types. For the operators, this may be of interest as you may experience enhanced communications on certain times and on certain bands. Rare DX Operators from the following countries have been active (And verified via IP-number) on HamSphere since the last News Letter. After downloading 3.0, please start the transceiver and login to make sure everything works in your computer. In March we unfortunately experienced some hardware problems with the hard drive of the master server. The master server is getting old (> 4 years) and is being replaced with new hardware. We are currently running two master servers and four slaves. The old master will be removed in July 2012. You may ping the new master (server6.hamsphere.com) and check the ping times to it. The iPhone and Android development is again delayed due to server issues, but will commenced as soon as all servers are stabilized. Thank you for your interest and the continued Support.